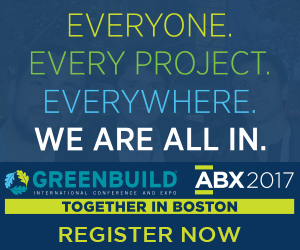 Greenbuild is the world’s largest event dedicated to sustainable building and is co-located this year with the ArchitectureBoston Expo (ABX). Join us and attend this remarkable week featuring 300 education sessions, workshops, summits and tours, 800 exhibiting companies and over 25,000 professionals from around the globe. Everyone. Everywhere. Every project. We are ALL IN.